Do you want to create an online CV and improve your online presence? With a personal resume website, you can build your brand, find jobs, make new contacts, and promote yourself professionally. Used by more than 31% of all websites online, WordPress is an ideal platform for creating your very own resume website. In this article, we’ll share our handpicked list of the best WordPress resume themes with which you can easily create an online resume. Get ready to open your door, because Opportunity is about to come a-knocking! To start your WordPress resume website, you’ll need a domain name and a web hosting account. Domain name refers to your website’s address on the internet, like Google.com or IsItWP.com. And, hosting refers to the physical location of your site on the internet where your site’s content and files are stored. A domain name normally costs around $14.99 per year and a web hosting plan costs around 7.99 per month. When these costs are combined, the total cost for starting a site can be quite high for an individual such as yourself. Thankfully, you don’t need to worry about the high starting cost anymore because Bluehost has a special discount offer for you. Yes, that’s right! We’ve made a special deal with Bluehost to offer our users a 60% discount on hosting plus a free domain. That means you’ll get hosting for just $2.75 per month and no charge at all for the domain. They’ll also provide a free SSL certificate to make your site more secure. We highly recommend you to grab this deal to get started. First, set up your hosting and domain. 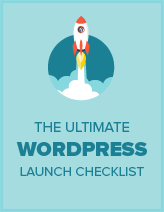 Then, you’ll need to install WordPress’ software and your resume theme. If you need detailed instructions, here’s our step-by-step guide on how to create a WordPress site. Now, let’s go ahead and check out 28 best WordPress resume themes for 2018. 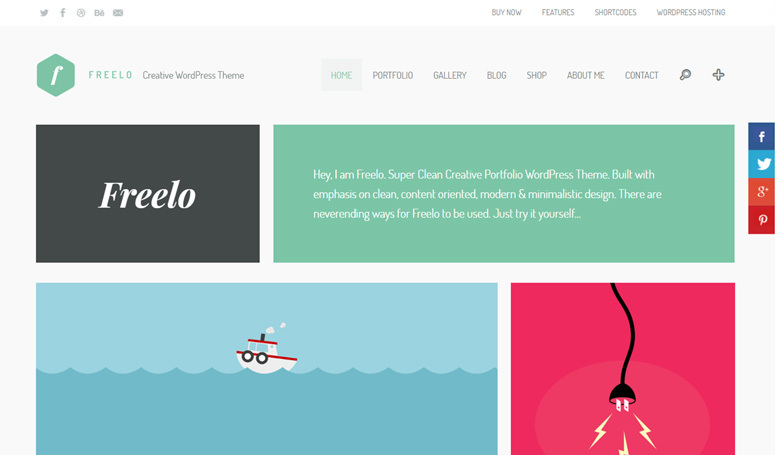 Freelo is an elegant WordPress theme suitable for freelancers, designers, photographers, or any type of creative professionals to build an online resume or portfolio. It has powerful portfolio options like multiple portfolios, multiple portfolio animation styles, multiple portfolio view styles, shortcodes, etc. to allow you to build a complete portfolio. The theme comes with a powerful visual drag and drop page builder which makes theme customization simple and effortless. You can edit all the site elements right from the frontend with its visual editor, allowing you to see your changes instantly as you make them. Besides, you can use unlimited colors, 600+ Google fonts, unlimited sidebars, and various page and post options. It’s a simple-yet-powerful theme that’s perfect for building a creative portfolio. Get started with Freelo today! ShiftCV is a modern WordPress theme to showcase your profile, skills, job experience, and testimonials in an eye-catching way. It also lets you provide print and download CV options on your site. It has a compact and clean design with sortable sections in a 1-page profile. However, you can also add a personal blog page to present your content in multiple formats like a blog article, audio, video, or slideshow. The theme lets you present your CV in 2 color schemes: dark or light. It’s fully responsive which means your site will look great on all devices. Get started with ShiftCV today! 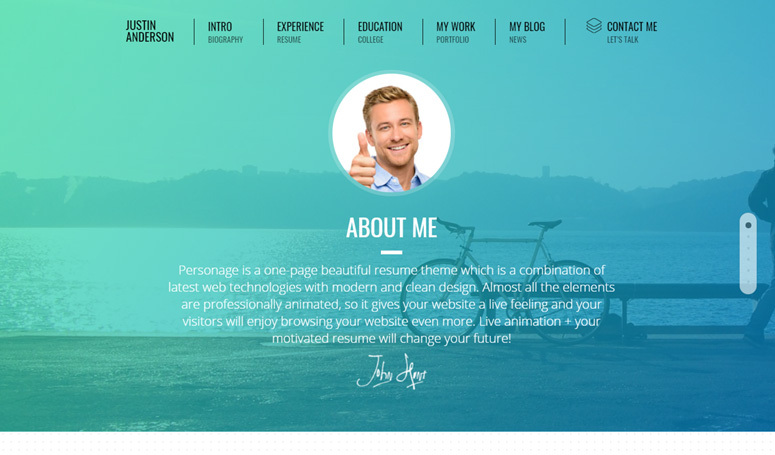 Resume is a stylish WordPress theme for presenting your CV in a creative way. It features a beautiful CV template with bold typography, vivid colors, smooth transitions, and effects. You can show your work skills, experience, awards, portfolio, etc. in an aesthetic way using this theme. It has a 1-page design with different bold sections like portfolio, blog, and contact. The contact section has options to show a contact form, phone number, address, and key testimonials. The theme optimized for speed to load faster, and is fully responsive so it’s adaptable to any device. Get started with Resume today! 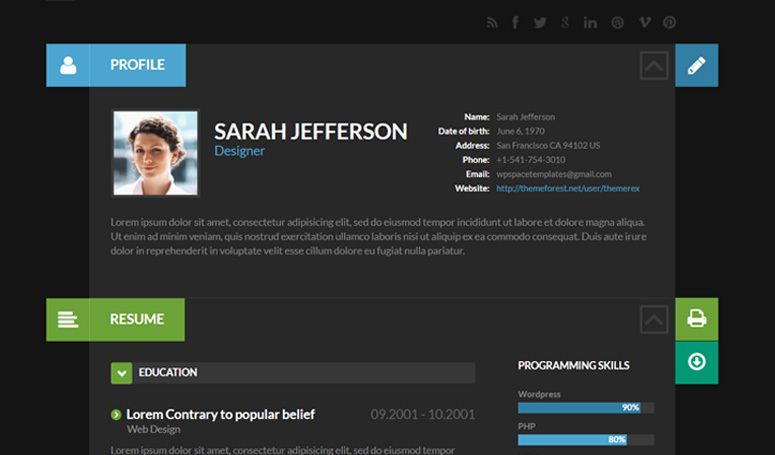 Personage is a professional resume WordPress theme for building an online CV. It features a sophisticated 1-page design with clean elements. To get started with your online CV quickly, you can import 1 of the 4 pre-designed demos and simply customize its content. 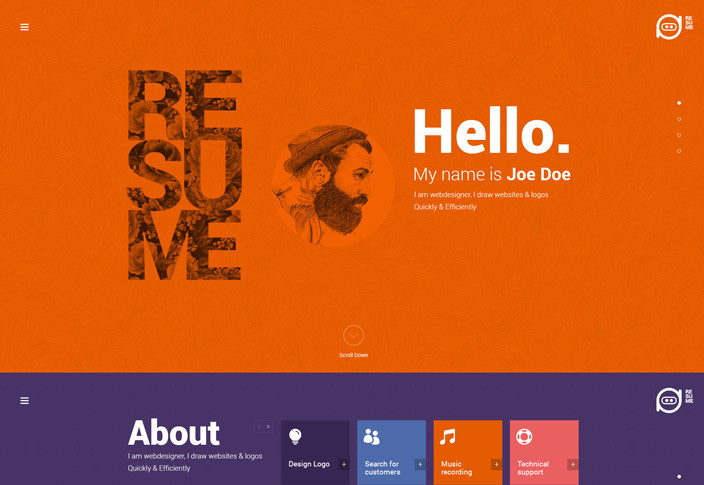 The theme lets you present your biography, experience, education, and work in a polished way. You can also add a Print button for your resume section so people can print or download your resume in PDF or Word formats. To allow people to easily contact you, it has the option to add a contact form with a map, as well as social icons. The theme also lets you add multi-format blog posts. Get started with Personage today! 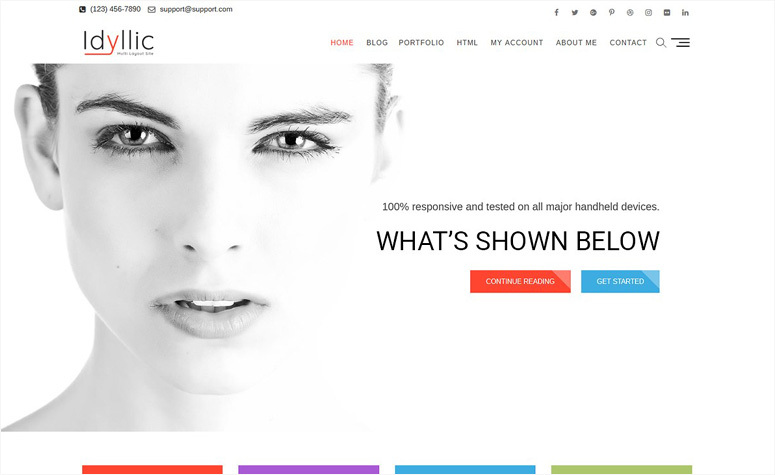 OneEngine is a stunning 1-page WordPress theme suitable for grand online portfolios and resume websites. It features a full-width slider header with bold text and professionally-designed sections for about, skills, team, work, blog, and contact on the homepage. OneEngine has a unique style for the about section which helps you show your company’s progress via a timeline. The portfolio section is great thanks to multiple filter options. Plus, it has a pricing table section. It’s an easy-to-use theme that anyone can use. Try it out, play with its options, and build yourself a fantastic online portfolio or CV. Get started with OneEngine today! Profession is an amazing WordPress theme to gracefully present your profession with a larger audience. It features stunning image sliders, sections for skills and achievements, a featured section for your work experience, and a contact option on the homepage. It’s basically a 1-page theme; however, it has a beautiful blog page to present your latest articles. Profession theme is stylish as it has horizontal scrolling design as well as vertical design. Besides, it also has options to add a full-screen background or a simple background. If you want an RTL website, it has full RTL support and a pre-made RTL demo. One interesting feature of the theme is its toggle menu, which lets you show your name / site title and website menu alternatively. Get started with Profession today! 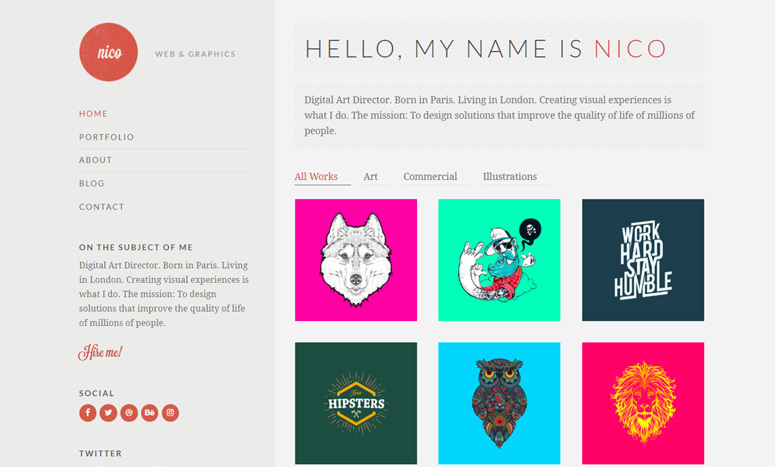 Nico is a simple-yet-elegant WordPress theme suitable for building an online portfolio, resume, or photography site. It comes with a truly unique design layout which helps you display your work beautifully and promote it to the next level. The theme features a filterable portfolio with cool animations that help you show your work via categories. It has flexible layout options and advanced customization options. There’re multiple color schemes, custom widgets, etc. It has the power of most popular page builder plugins: Elementor, Divi, and Brizy. Of these 3 plugins, you can choose 1 for customizing your site. Get started with Nico today! Resume, CV, vCard & Portfolio is the theme you’re looking for if you want to create a resume, CV, vCard, or Portfolio. The theme’s name speaks for itself actually. It features a distinct and beautiful layout to build a full-fledged resume website. The theme comes with 2 background versions: dark and light. You can import a demo with 1 click, instantly customize it, and get your website ready in no time. There’re unlimited color options to design different parts of the site. To let you customize your online resume with ease, it has a drag and drop page builder integrated. You can use 800+ Google fonts, 1000+ icons, multiple maps, amazing page transition effects, etc. Get started with Resume, CV, vCard & Portfolio today! Marvel is a truly marvelous WordPress theme for portfolio and resume websites. It features a unique vertical navigation menu that sticks in the left sidebar, making look creative and visually appealing. With Marvel theme, you can use unlimited header and menu layouts. It’s easy to customize the theme with a powerful theme options panel which allows you to customize with just 1 click. Similarly, you can also import the theme demo with just 1 click and quick start your website. You can use custom colors, custom widgets, Google fonts, Google maps, etc. to build a perfect resume site. Get started with Marvel today! 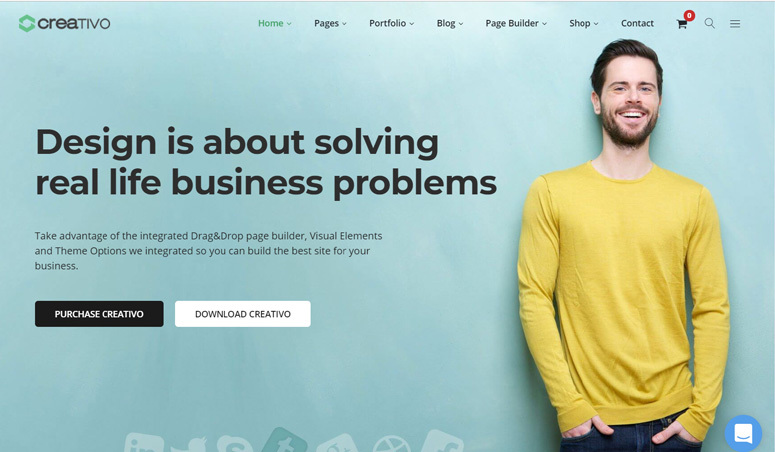 Creativo is a multipurpose WordPress theme with advanced customization options. You can create a wide range of websites using this theme. It has 17 ready-to-use website demos that you can import with 1 click and quick start a website. The theme is highly customizable with the power of the most popular visual page builder plugin by WPBakery. In addition, you can get Slider Revolution and LayerSlider plugins free with this theme. For creating a full-fledged resume website, it has built in sections for a portfolio, photo galleries, services, team, etc. It’s fully responsive and retina-ready. Get started with Creativo today! Designer is a wonderful WordPress theme for designers and artists of any kind, such as photographers, musicians, and videographers. It lets you create gorgeous image and video galleries to showcase your latest work in an impressive manner. The theme features several portfolio styles including tiled, landscape, portrait, and square to display your work. You can effortlessly configure its settings and customize the theme with zero coding required. It has a minimal and responsive design that’s professional and aesthetically pleasing. Get started with Designer today! 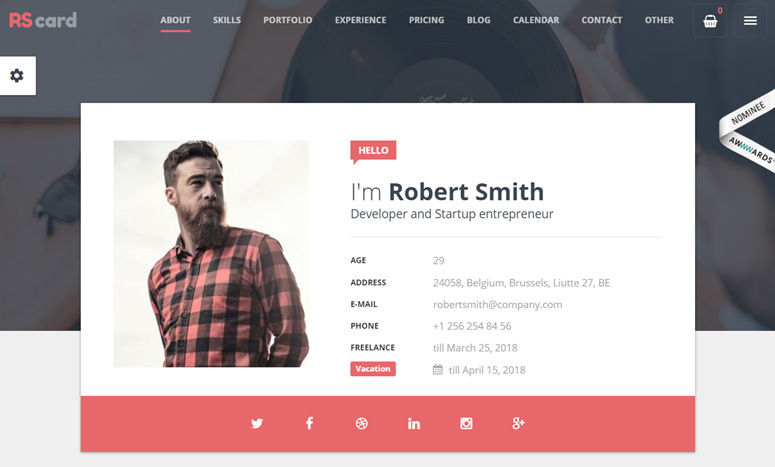 Resume, CV & vCard is a theme for professionals to create a great online portfolio. It’s suitable for startup entrepreneurs, doctors, singers, students, actors, and anyone else who wants to create an impressive online presence. It features beautifully-designed sections for education, work experience, skills, statistics, portfolio, services, clients carousel, availability calendar, contacts, Twitter and Instagram sections, and pretty much anything else you can think of that you may need on your online portfolio site. With this theme, you can choose any color you like, use 800+ web fonts, icons fonts, social icons, and custom shortcodes. 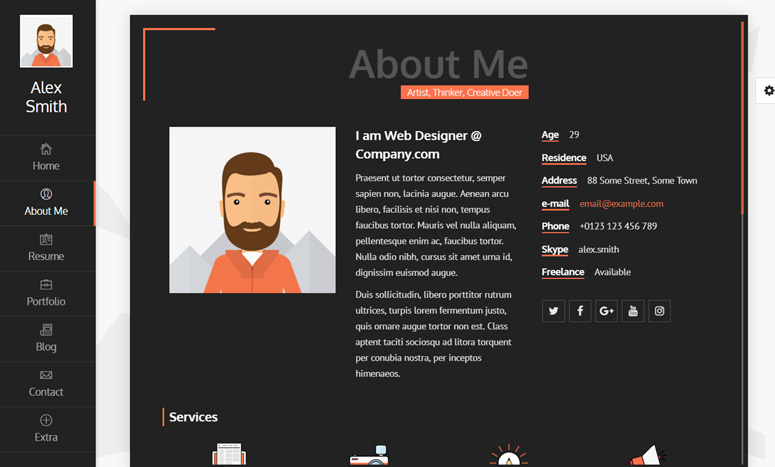 Get started with Resume, CV & vCard Theme today! If you want to highlight your latest creative work with elegance, North is the perfect WordPress theme for you. 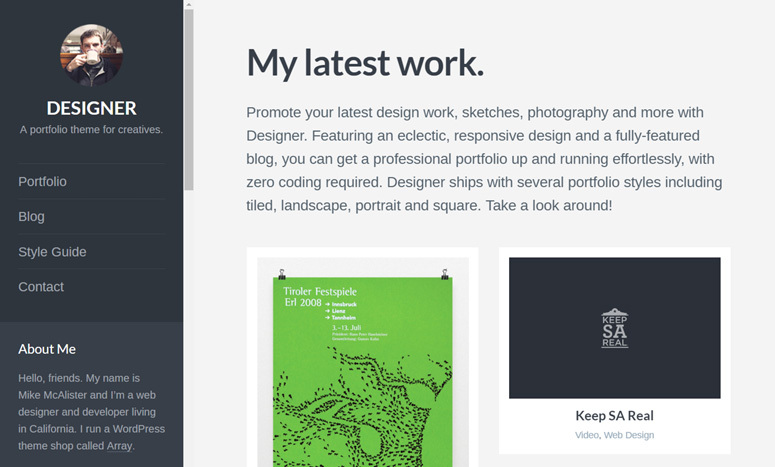 It has a clean, elegant design for an online portfolio. It supports image galleries, audio, and video media formats to showcase your content. The North theme has a Live Customizer which lets you customize everything and anything on your site with a live preview. You can change your site title, link color, header color, accent color, upload a logo, and more with just a few clicks. North has an SEO optimized code which helps your site to get better rank in search results. It’s fully responsive and fits well on all screens. Get started with North today! 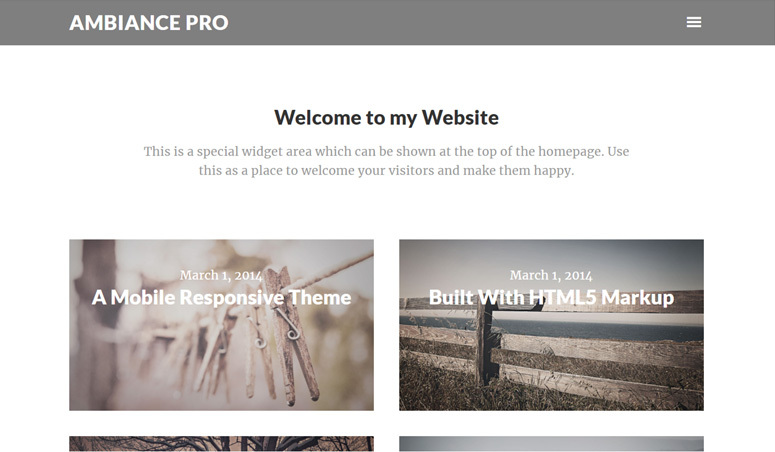 Ambiance Pro is a powerful WordPress theme for professionals to present their portfolio in an impressive manner. It comes with the power of the popular Genesis theme framework which provides SEO optimized code, fully responsive design, and unlimited customization options for your theme. With the Ambiance Pro theme, you can choose custom page templates such as default, archives, blog, and landing page. The powerful theme customizer lets you tweak your theme’s settings and content easily and with live previews. Plus, you can customize your site’s header by uploading a custom logo or text-based logo. There’s also a homepage widget area to allow you customize your site to fit your brand. Get started with Ambiance today! Hired is a unique-style WordPress resume theme for professionals who want to get hired for the best jobs around. You can present your brief biography, resume, contact information, and social media accounts beautifully online using this theme. It has different templates for default page, blog page, single posts, and homepage. The homepage design is unique with a 2 column layout, integration with your social media accounts, a welcome message section, and a full-screen header image. The theme lets you use unlimited colors, Google fonts, and any local language you want. It’s SEO optimized and responsive on all screens. Get started with Hired today! Saturn is a 1-page WordPress theme suitable for creating a personal CV or resume website, portfolio, or a landing page. It comes with 3 beautifully-designed demo layouts that are ready to install in 1 click. If you don’t want to start a website from scratch, you can instantly install a demo and get started with your site. The theme comes with the standard Customizer to help you personalize the look of your site. You can customize almost all the elements of your site with live previews. 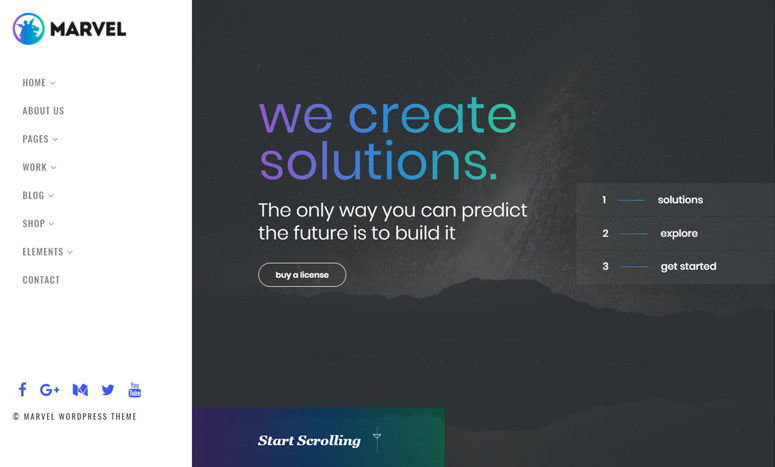 The ever-popular Slider Revolution plugin is included for free with this theme, allowing you to create responsive sliders. Plus, you can create a filterable masonry portfolio to present your latest work. Get started with Saturn today! 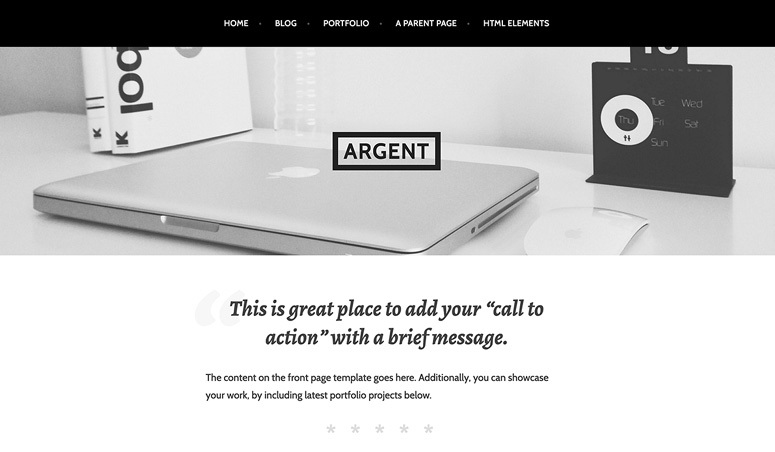 Argent is a free WordPress theme suitable for creating a modern portfolio or a resume website. It comes with a homepage that features portfolio projects so it’s a great theme for creative professionals looking to display their work wonderfully online. Besides, the theme has a clean blog page layout to present your articles. To make your site stand out, it lets you customize your header with logo upload options and footers with various widgets. The theme has a fully responsive layout that offers a seamless user experience and ensures a stunning appearance on all devices and screens. Get started with Argent today! 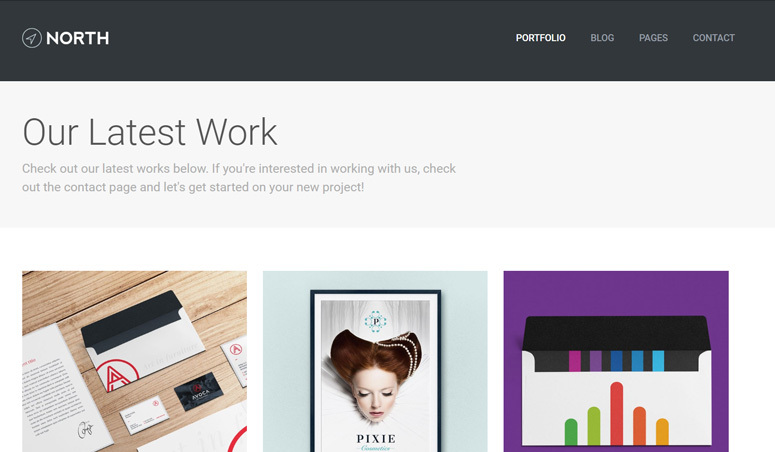 Meteor is a fabulous portfolio and resume template for WordPress. It’s great for photographers, designers, businesses, and students. The theme features 4 different portfolio page templates: grid, masonry, carousel, and blocks. It also has 3 different post layouts (i.e. carousel post style, mosaic post style, and centered post style) to help you customize the layout of each of your projects. Meteor has options to add services, blog, contact, subscription form, etc. to make your site complete. Get started with Meteor today! If you want to create a hub for your social media profiles as well as showcase your portfolio, Profile is the perfect theme. It comes with a stylish homepage that shows your profile photo at the center with your social account icons surrounding it, a horizontal navigation menu, and image background. 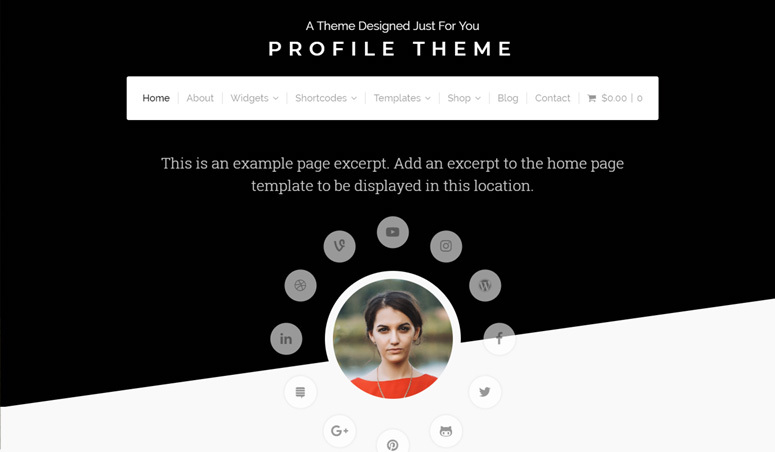 The theme features a wide range of custom widgets including profile, testimonial, team, pricing, featured content, slideshow, and blog. Similarly, it has multiple custom shortcodes for buttons, icons, columns, headings, etc. It’s a WooCommerce-ready theme that lets you create a shop page easily on your site. Get started with Profile today! 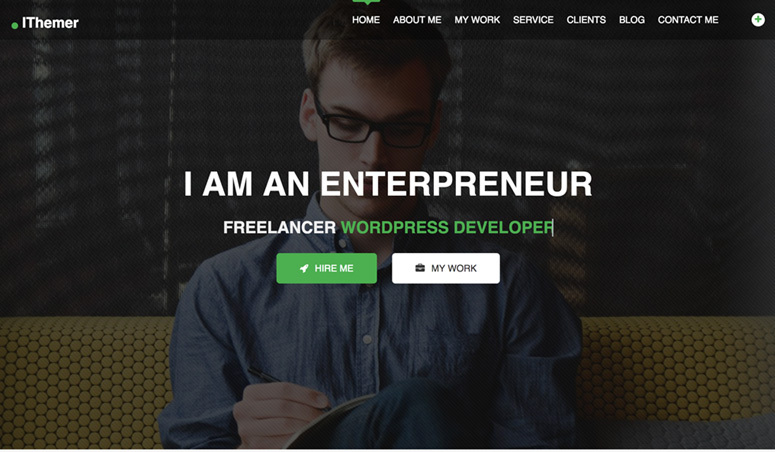 iThemer is a free premium WordPress theme for resume and portfolio. It comes with a featured image header with a welcome message and two buttons for hiring and your work. Moreover, it has a simple list blog layout, animated banner, about us, services, work and portfolio with fancybox, counter up, experience timeline, client and footer widgets. With iThemer, you can use Google fonts, Font Awesome icons, social links, etc. and show off your creativity. The theme allows you to import the demo content with 1 click and get started with your resume site instantly. For customizing the theme options and design, you can use the Live Customizer which lets you customize your site with real-time live previews. Get started with iThemer today! 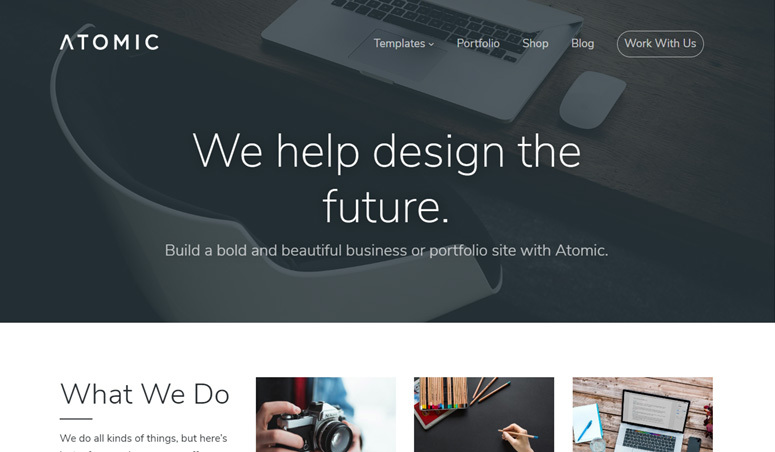 Atomic is a multipurpose WordPress theme suitable for creating a portfolio as well as a business website. It comes with beautiful templates for teams, services, testimonials, portfolio, blog posts, and more. 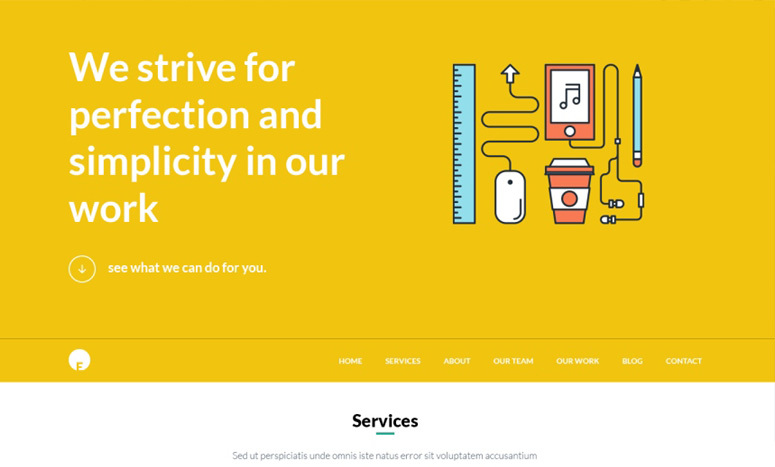 The theme has stylish typography and intuitive organization for its different site elements. It allows full customization of your site’s header by changing a header image, background color, image opacity, text, etc. Most importantly, to let you showcase your latest projects, it has options to add image galleries, videos, etc. in different styles. 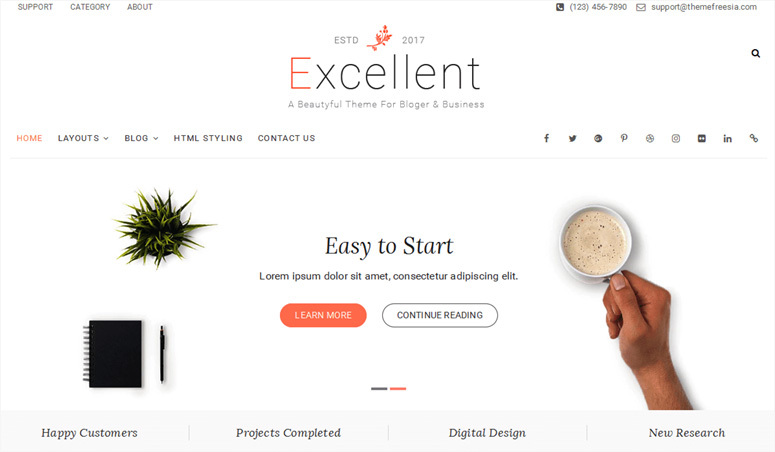 Excellent is a freemium responsive theme for creating professional business, blog, CV, and portfolio sites. It comes with a full set of excellent features that enable you to build a great-looking resume site in no time. The theme features cool templates for portfolio, gallery, blog, testimonials, contact us, etc. You can also find custom widgets, multiple navigation and social menus, and endless color options to make your site’s design unique. It has a handy demo for a standard CV that has a profile photo and profile details in 2 columns on the homepage. Below that, there’s a beautiful portfolio section to showcase your latest work. Get started with Excellent today! 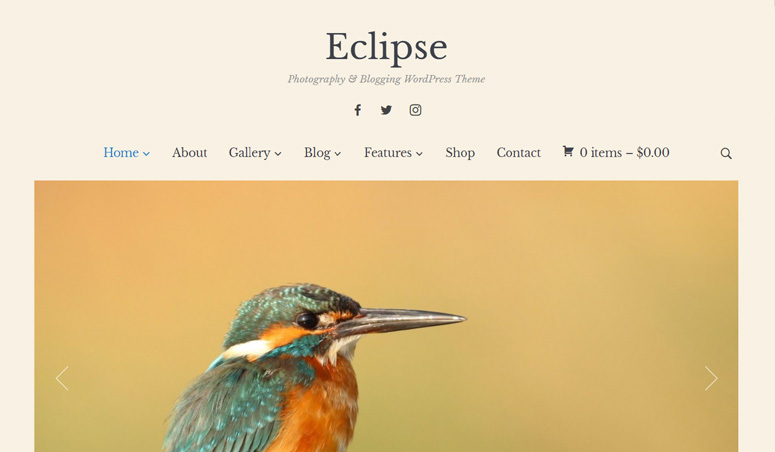 If you’re a photographer and looking for a theme to showcase your wonderful photos, Eclipse is the perfect theme for you. The theme comes with beautiful slider options in the header, image galleries, portfolio posts, and cute blog templates. The theme provides options to add widgets in the homepage where you can add any widget you like including your about page, Instagram widget, buy option for your photo prints, etc. The theme is WooCommerce-ready so you can create a shop page and sell your photographs. Eclipse has built-in Live Customizer which allows you to change the design of your site with immediate live previews. Therefore, it’s easy and quick to customize the theme. Get started with Eclipse today! 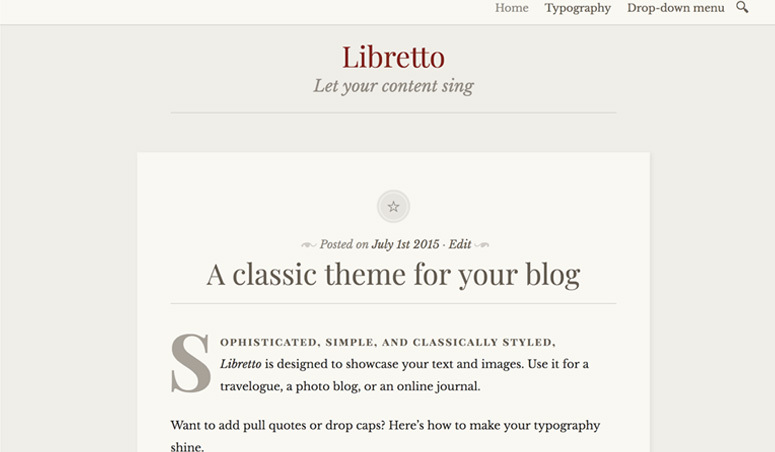 Libretto is a free responsive 1-column theme for WordPress. It features a classic style and careful typography details so that your site content looks classy. It’s ideal for showcasing articles with large images or for photo stories with inspirational quotes. 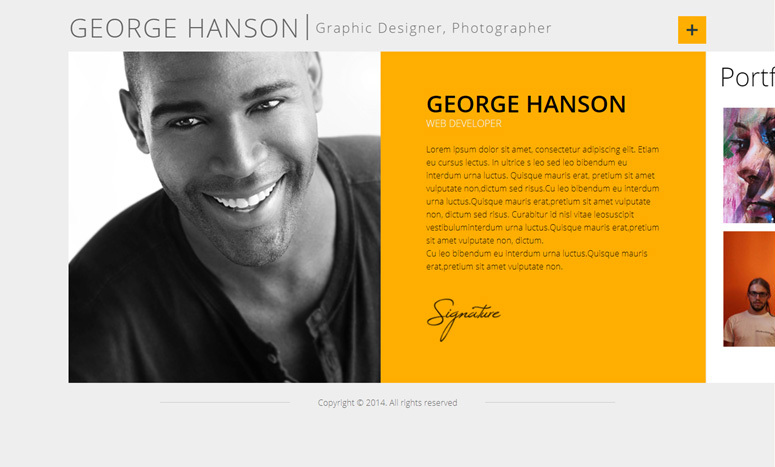 So, if you’re an inspirational photographer, it’s a perfect theme to start your resume website. Libretto provides beautiful templates for blog, about, and contact page. The theme is so simple and easy to use that even a person with absolutely no coding skills can build a complete site using this theme. Get started with Libretto today! 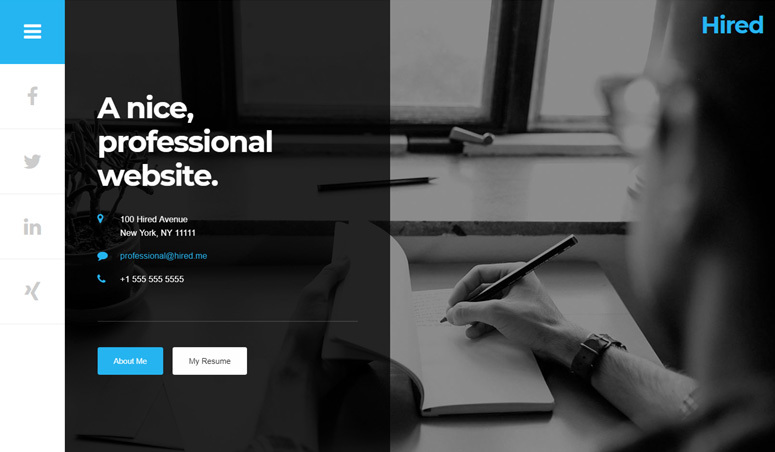 Resumee is simple WordPress resume theme for professionals. It has a clean design with an all white background. You can add a profile photo, social links, contact details, and a short bio at the top of your homepage. It’s basically a 1-page theme with different sections for work experience, education, and skills right on the homepage. 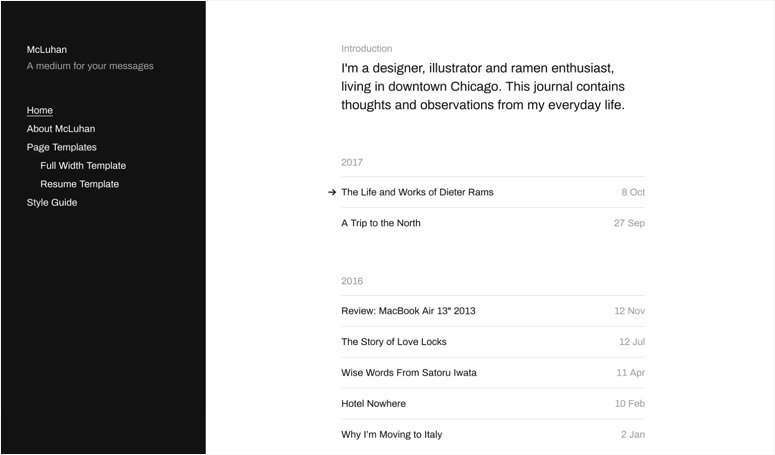 It’s a direct and distraction-free minimalist resume theme. Idyllic is a beautiful multipurpose theme for WordPress that you can use for creating a variety of websites. With its extended features and options, you can use it for business, portfolio, blog, or online resume website. The theme comes with multiple sections as well as widgets on the front page. There’re multiple navigation and social menus, logo upload, and color options. For showcasing your selected works and latest projects, it has several fabulous portfolio layouts. Get started with Idyllic today! 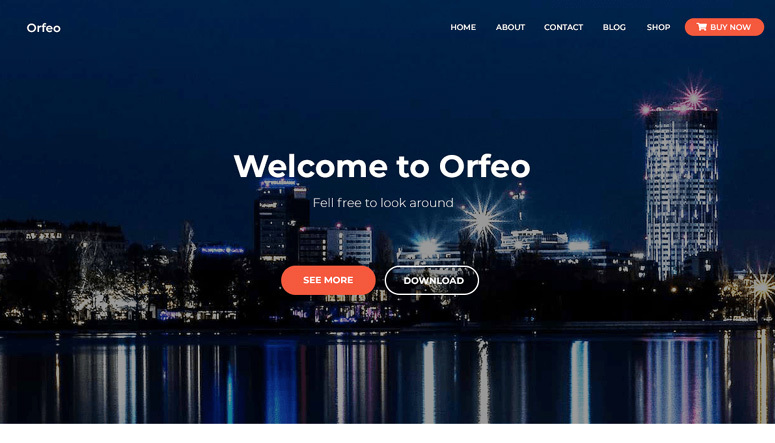 Orfeo is a responsive 1-page WordPress theme designed for multipurpose sites. You can build corporate business sites as well as a blog, portfolio, or online resume site using this theme. It features beautifully-designed sections for features, team, testimonials, products, pricing, blog, contact, etc. If you’re an entrepreneur, blogger, or a student, this theme provides you with ample features to create your impressive online portfolio. You can use custom backgrounds, mega menus, etc. and customize the entire theme’s options from its Live Customizer. It’s an SEO optimized and fast loading theme that lets you create a truly powerful site. Get started with Orfeo today! McLuhan is a free WordPress theme with a simple and clean design. It features a front page with a complete post archive arranged by year to give your users a quick glimpse of your work via the custom timeline. 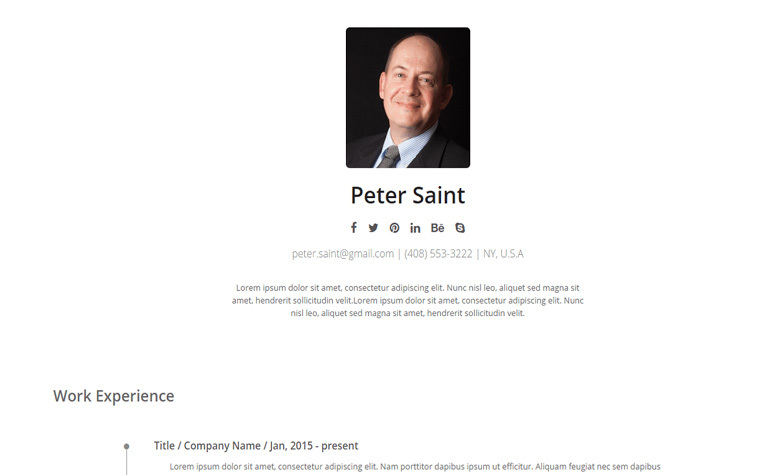 With McLuhan, you can get 2 predefined page templates: a resume page template and a full-width template. Using the resume template, you can easily create your online resume. The theme allows you to customize background colors for the sidebar and content, plus add social links and icons. It has an AJAX-powered mobile search with instant results. Get started with McLuhan today! 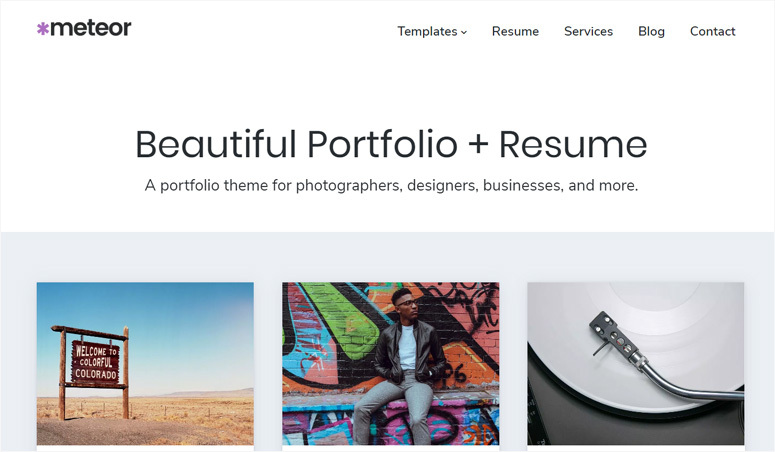 We hope this article helped you to find the best WordPress resume themes for creating an online resume, CV, and portfolio. You may also want to see our guide on how to make money from online blogging.